Ah, the places you can see in Summers county are amazing. An afternoon drive in any direction will always provide you with panoramic views, waterfalls, wild animal sightings and other delights. Here are a few we have come across. I will changes these from time to time to share other scenes with you. A fantastic shot somewhere on Ramp Mountain. A.C. was the photographer for this photo. pictures and I did not tell him how to drive. This worked just fine ...... most of the time. Cooper's Mill off Ellison Ridge Road is being restored under the stewardship of Jack Wills. 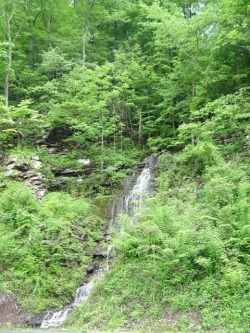 Where will you find this beautiful waterfall in Summers County? ducks, fishermen and canoers enjoying life on New River.